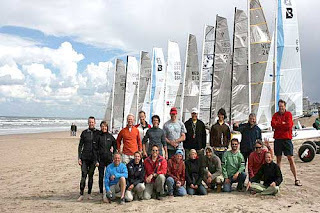 Past Saturday we participated in the EuroCatsCup, held at our club, VVW Heist. This race is a famous race, held every year on the last weekend of August, with around 60 participating boats, from Belgium and Holland. 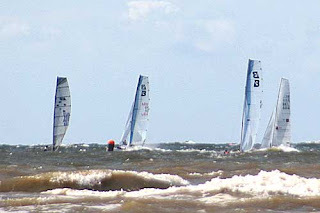 A mix of Nacra Infusion, Hoby Tiger, I20's and some smaller boats (C3 class) like the Hobie 16. We were the only F16 boat and we ended 19th. 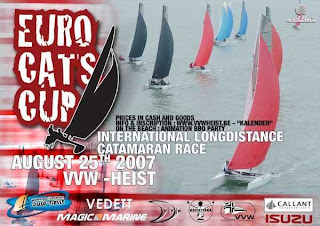 EuroCatsCup is a long distance race from the Belgian to the Dutch coast, with start and finish in front of the club VVW Heist. The race starts with a triangle, followed by 2 loops with turning point between Cadzand and Groede. We were happy with the boat speed but did make some bad tactic decisions. We rounded the A-mark 13th but lost ground on the way back from Groede to Cadzand. There was more wind closer to shore and we stayed in too deep. Lesson learned! This was the flyer made for this race. 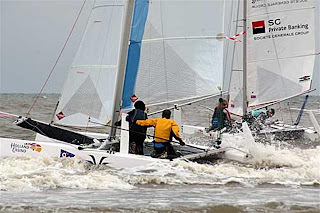 Formula 16 catamaran sailing - what's it all about? 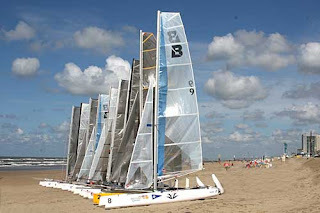 Formula 16 is a multi-manufacturer class for beach catamarans, designed for the 21st century. The F16 design is modern. Gone are the days when a seaworthy 16 foot catamaran had to weigh 150kg and when the use of carbon meant spiralling costs. F16 minimum weight is just 107kg (104kg 1-up) with few restrictions on materials and yet costs are no more than for other race catamarans. The inclusion of an asymmetric spinnaker adds to the excitement. The F16 design is practical. Do you enjoy sailing as a team but hate getting stranded on the shore when the crew doesn't show? Do you sail on your own but want the option to take friends and family out? The F16 is designed to sail equally well 1-up and 2-up, and what's more both configurations race each other on elapsed time. And at 104kg, the F16 can not only be sailed singlehanded - you can launch and right it on your own too! The F16 design is fast. A light-weight platform, generous sail areas and an asymmetric spinnaker can mean only one thing: speed. In 2-up mode the F16 races the F18 class on elapsed time - first in wins. 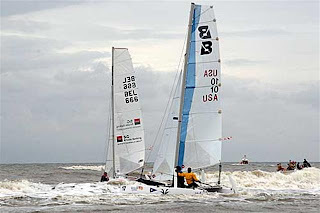 In 1-up mode, with asymmetric spinnaker, it races the A-cats on elapsed time. All the boats lined up on the beach. Beautiful! Group photo of all the teams in front of the boats. Nice!! Racing. You see Kathleen on the wire. Launching in the surf. You see us (right) and Matt and Bart (left). 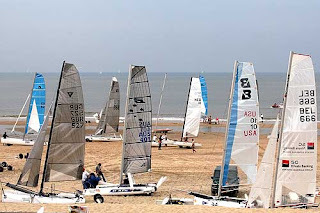 All the boats on the beach, ready for the first race. We are very proud with our results on this first Global Challenge. After a hectic start (2 capsises, one on sunday and one on monday) we were able to show what we are capable of. We ended third, after Matt and Bart (2nd) and after Hans (1st) who is the first winner of the first Global Challenge F16!